Awesome. Totally Beyond All Expectations. My wife and I completed the 6 day trip through the Grand Canyon. The whole trip could not have been better. The organization, schedule, guides, food, and sleeping under the stars were all magical. Everything was handled very professionally. Our guides, Lucky, MP, Amber and Sam were all special people who went far beyond the call of duty to make our adventure trip so awe-inspiring. It was evident that they love their work and wanted all of their guests to become enamored in the beauty of the canyon. The food was absolutely out of this world. Couldn't believe the gourmet meals of steak, chicken, spaghetti, and rainbow trout. And then on the 4th night pulling out ice cream for dessert. I thought wow, we are in the Grand Canyon and are eating ice cream. I loved all the hikes. They were truly inspiring and adventurous. 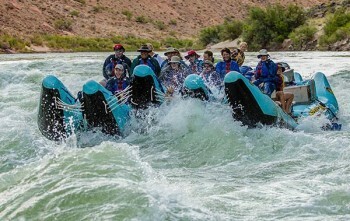 Also, I loved hearing all the stories about others who went down the Colorado River and how some of the rapids bear their names. Thank you for making this truly a trip of a lifetime.